Veterans Shuffleboard Clinic by Palm Gardens in Mesa Arizona. Dale Monday Speaks: This is the 2nd year that our resort (Palm Gardens) has held this clinic for the Veterans participating in the Phoenix VA Hospital Rehabilitation Program and like last year this was a successful and rewarding event. 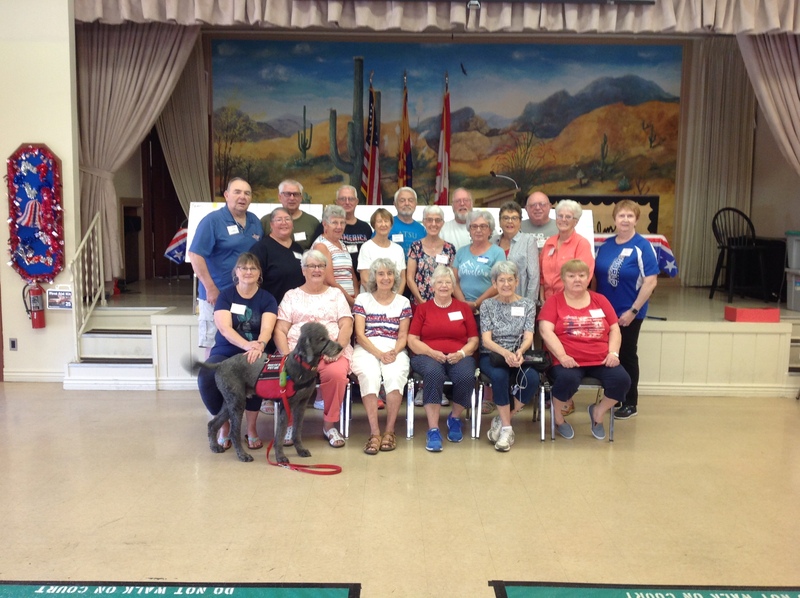 VETERAN’S SHUFFLEBOARD CLINIC – The Palm Gardens RV & Manufactured Home Community in Mesa, Arizona just completed it’s 2nd Annual Veteran’s Shuffleboard Clinic. The clinic is for Veterans who are in the Phoenix VA Hospital Rehabilitation Program. Twenty-two Veterans attended this six session clinic that was held two times a month in April, May & June. In the last clinic there was a tournament followed by a luncheon and awards ceremony. The luncheon was provided by the Palm Garden Resort Owners and the awards were donated by M & S Shuffleboard. Twenty-five volunteers from Palm Gardens helped with the clinic.